Carisbrooke is the Island’s only medieval castle. It was begun soon after the Norman Conquest, by William FitzOsbern, the Island’s first Norman lord. Its central location reflects its original purpose: to control the potentially hostile local population. The typical Norman motte and bailey layout, established 900 years ago, is still clear today. The steep banks, high walls and remains of towers and loopholes are reminders that it was designed to withstand medieval siege weapons. When the development of artillery made the old motte and bailey obsolete, the Castle’s military relevance was extended in the 1590s by the addition of new defences. The new fortification surrounds the out-of-date medieval ramparts and was designed to withstand an artillery attack. 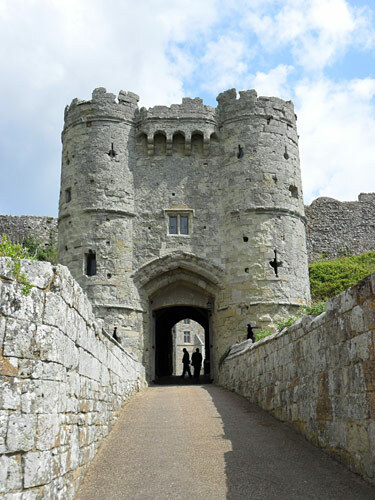 It made Carisbrooke one of the most up-to-date fortifications in the country. The Castle was a home as well as a fortification. The medieval domestic buildings, including the Great Hall, were occupied for centuries in both war and peace by the Island’s lords, captains and governors. They are now the home of Carisbrooke Castle Museum. Now in the care of English Heritage, the Castle is a Grade I listed building and significant tourist attraction. Famously, it was the prison of King Charles I for nearly a year, and also retains a working donkey-powered treadwheel for raising water from the medieval well.